Secret Code Math is a set of printable (pdf) math worksheets. 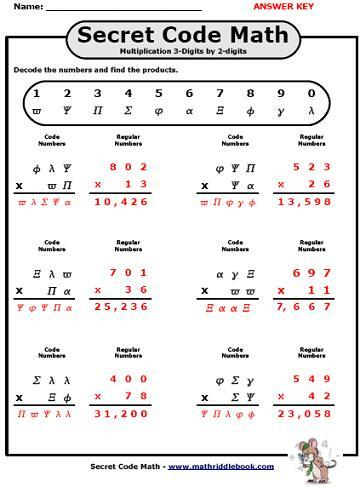 Each worksheet has math problems encrypted with a secret symbol code. 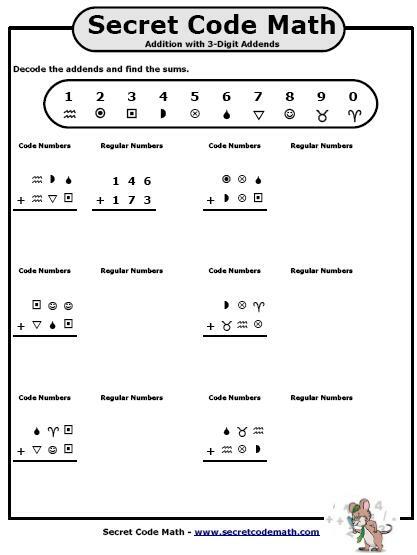 Kids must use the symbol key to decode the numbers in the problem, then find the answer. 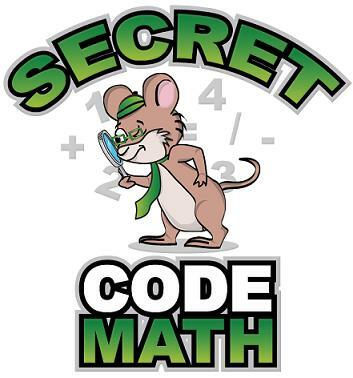 Teachers and parents love the math practice that Secret Code Math provides. Kids love decoding the problems - it's like solving puzzles! Instantly download the pdf version of Secret Code Math right now! Since this is a digital file, you're not paying for printing costs, retail markup, or shipping fees. You can order the worksheets 24/7 and download them instantly! These are pdf worksheets, so you can view and print them from any Windows or Mac computer. Take a Look at All the Worksheets... for Free! You can preview all of the worksheets for yourself before you purchase. See if Secret Code Math is right for you. Just use the Preview Button below to view! I have discontinued the "Secret Code Math" ebook because I don't have the time or ambition to update and maintain it. You can find similar math worksheets on Super Teacher Worksheets. If you are an existing customer and you need help, please feel free to contact me any time. If you have any comments or questions about the worksheets, I welcome your e-mail. I am confident that your students will enjoy practicing Math with these Secret Code Worksheets! If you purchase and you're unhappy for any reason at all, just let me know within 8 weeks and I'll give you a no-hassle refund. So give it a try... you've got nothing to lose. The regular price for Secret Code Math is $16.95. But order today and you can participate in our special Summmer Sale and download the entire package of Secret Code Math Worksheets for only $12.47! Download now.... this price will be going back up around back to school time! Secret Code Math can supplement any elementary math program! I have discontinued the "Secret Code Math" ebook because, unfortunately, I don't have the time to update and maintain this site. If you are an existing customer and you need help, please feel free to contact me any time. My email is at the bottom of this page.